Bringing together hundreds of employees with dozens of local nonprofits and schools where they have volunteered, Intel held its annual celebration of its Intel Involved Matching Grant Program on Monday. Five hundred fifty Intel employees gathered with 24 local nonprofits and schools to celebrate the program that combines financial and volunteer support. When employees volunteer with schools and nonprofits, their volunteer hours are matched with dollars from Intel. 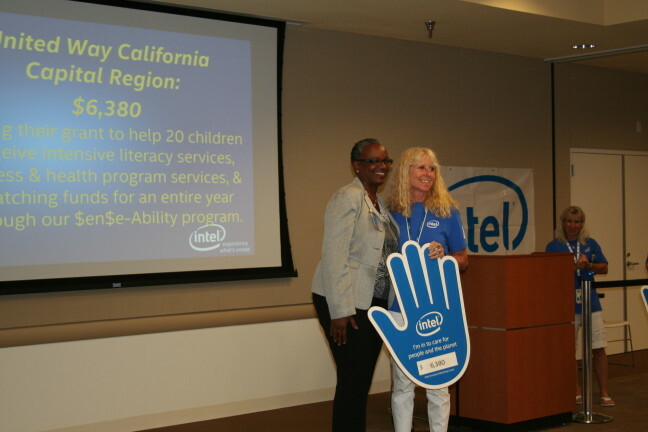 The event included check presentations to local nonprofits and school districts, prizes and a tour of Intel’s Innovation Center and lab facilities. In 2014, more than 3,000 Intel Folsom employees participated in the Intel Involved program – more than half of the employee population. They donated more than 240,000 volunteer hours to local nonprofits and schools that resulted in matching grants totaling nearly $2 million, including $216,755 to Folsom Cordova Unified School District and $193,570 to San Juan Unified School District. The Intel Involved Matching Grant Program aims to recognize and motivate Intel employees, globally, to engage in outreach and volunteerism to make communities a better place to live, work and play. Its objective is to support employees giving their time and talent to qualified nonprofits, non-governmental organizations and schools. After a minimum of 20 hours has been accrued by Intel employees volunteering at a school or qualified nonprofit, a donation match grant of $10 per hour volunteered is triggered from the Intel Foundation with a maximum of $15,000 per school and $10,000 per nonprofit each year.